A lodgepole pine forest surrounds a small resort, day-use area, and four campgrounds. Sandpipers flock along the shore among swimmers. Water skiing, fishing, and hiking are popular summer activities. 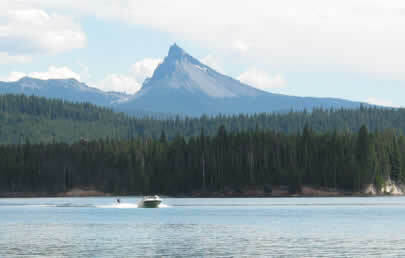 Spectacular views of the High Cascades can be seen from the lake. In the winter, cross-country skiing and snowmobile trails lead through sparkling landscapes. The resort phone number is (541) 643-8750. Day visit. The original brochure is a cooperative project developed by the Roseburg and Medford Districts - Bureau of Land Management, and the Umpqua and Rogue River-Siskiyou National Forests.